Alternative splicing of pre-mRNA generates a highly dynamic human proteome through networks of coordinated splicing events, and is regulated on tissue-specific stage-dependent way. Our goal is to establish a new paradigm on the mechanism of morphogenesis from the view point of mRNA processing regulation. We will also try to find chemical modifiers of mRNA processing, which will be applicable for clinical therapy against malignant tumors, virus infections and neuromuscular diseases caused by aberrant splicing. We welcome enthusiastic young researchers who will challenge to open new fields of biology. 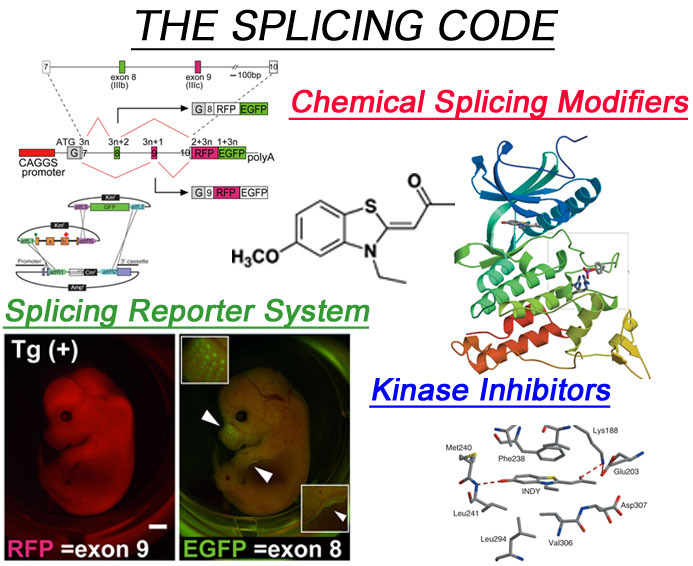 Alternative splicing events are dynamically regulated in developmental stage-dependent and tissue specific manners, and regulated by ‘splicing code’ made up of loosely defined consensus sequences. 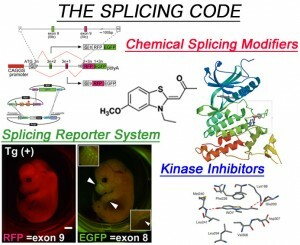 To decipher the splicing code, we have developed transgenic alternative splicing reporter systems that enable us to visualize alternative splicing events in living cells. There is a growing awareness that misregulations of mRNA processing are causative of many human diseases. We focused on the mRNA splicing process, and have developed compounds that alter the alternative splicing events or even reverse some misregulated splicing events. We are one of pioneers of chemical biology field, Chemical biology is one of new and rapidly growing research fields, and we are one of pioneer groups of this field. Using new techniques of chemical biology, we are challenging to develop novel drugs to cure hereditary diseases, cancers, virus infections, and other incurable diseases. Takeuchi A, Iida K, Tsubota T, Hosokawa M, Denawa M, Brown JB, Ninomiya K, Ito M, Kimura H, Abe T, Kiyonari H, Ohno K, and Hagiwara M (2018) Loss of Sfpq causes long-gene transcriptopathy in the brain. Cell Reports. 2018 May 1;23(5):1326-1341. doi: 10.1016/j.celrep.2018.03.141. Ajiro M, Sakai H, Onogi H, Yamamoto M, Sumi E, Sawada T, Nomura T, Kabashima K, Hosoya T, and Hagiwara M (2018) CDK9 Inhibitor FIT-039 Suppresses Viral Oncogenes E6 and E7 and Has a Therapeutic Effect on HPV-Induced Neoplasia. Clin Cancer Res. 2018 Sep 15;24(18):4518-4528. doi: 10.1158/1078-0432.CCR-17-3119. Epub 2018 Apr 30. Nakano-Kobayashi A, Awaya T, Kii I, Sumida Y, Okuno, Yoshida S, Sumida T, Inoue H, Hosoya T, and Hagiwara M. (2017) Prenatal neurogenesis induction therapy normalizes brain structure and function in Down syndrome mice. Proc Natl Acad Sci USA. 114(38):10268-10273. Kii I, Sumida Y, Goto T, Sonamoto R, Okuno Y, Yoshida S, Kato-Sumida T, Koike Y, Abe M, Nonaka Y, Ikura T, Ito N, Shibuya H, Hosoya T, and Hagiwara M. (2016) Selective inhibition of the kinase DYRK1A by targeting its folding process. Nat Commun. 7:11391. doi: 10.1038/ncomms11391. Yoshida M, Kataoka N, Miyauchi K, Ohe K, Iida K, Yoshida S, Nojima T, Okuno Y, Onogi H, Usui T, Takauchi A, Hosoya T, Suzuki T, and Hagiwara M, (2015) Rectifier of aberrant mRNA splicing recovers tRNA modification in familial dysautonomia. Proc Natl Acad Sci USA. 112(9):2764-2769.